UGG. 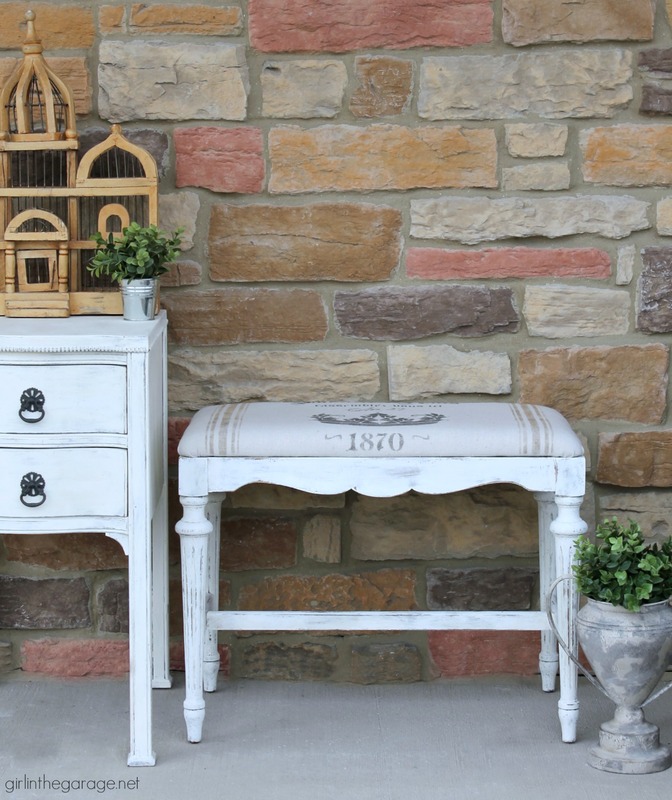 Have you ever updated a piece of furniture and thought you did a pretty awesome job but then it sat and sat and sat in your booth and no one bought it? 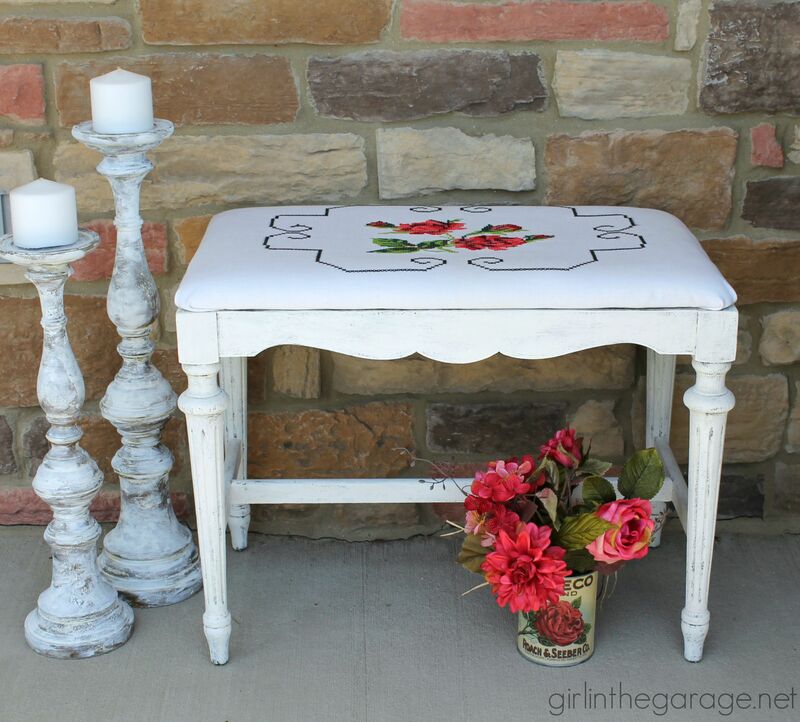 That summer I gave it a makeover with fresh white paint and an antique embroidered pillowcase (read all about it Here) and I thought it was so pretty. Isn’t it pretty?? Apparently it wasn’t the right style for most people, so after almost a year I brought it back home. Thankfully it was small and didn’t take up much room in my booth. 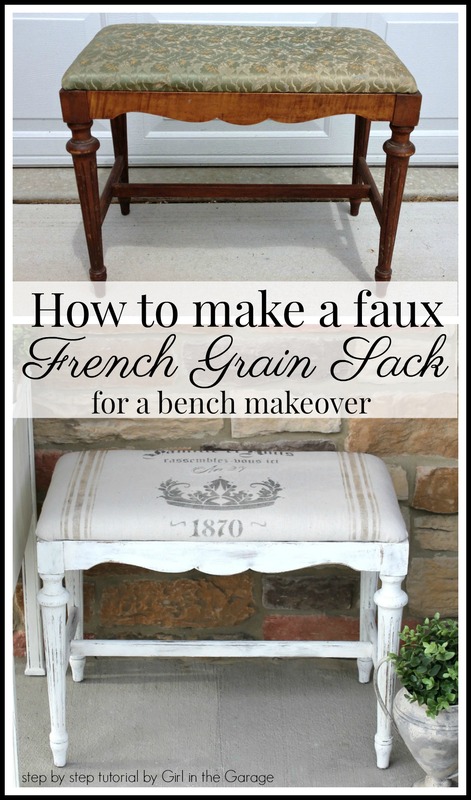 After all those years of waiting I finally figured out what to do with the bench for this month’s Furniture Fixer Uppers project: a faux DIY French grain sack makeover. First I unscrewed the seat and set it aside. I didn’t want to repaint the wood, but I did want it more roughed up and distressed looking so I sanded it with 320 grit sandpaper. * This post contains some affiliate links so you can easily find the products I use and recommend. 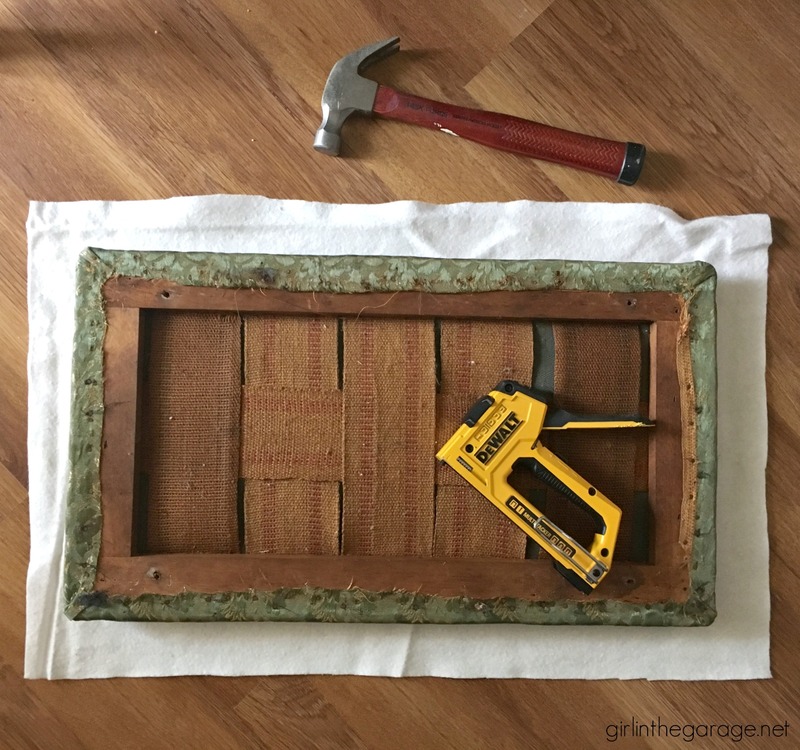 Learn more about all of my favorite DIY products and tools here. Next I carefully removed the embroidered pillowcase that I had used to recover the seat the first time. 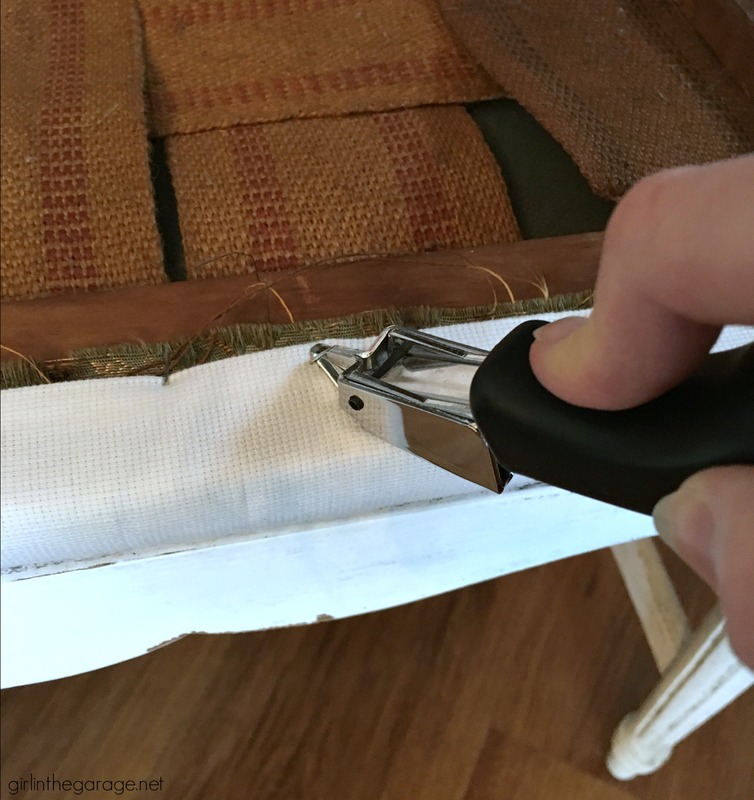 Using an upholstery staple remover like this one really helps the job go faster – I really don’t know how my hands survived so long without it. It also helps to have needle nose pliers nearby in case a staple breaks while still lodged in the wood. The seat and padding were still in pretty good shape so I opted to just recover it again. I cut cotton batting first (I buy it by the yard – this type is my favorite) to add a little bit of extra softness and a light color for under the new fabric. 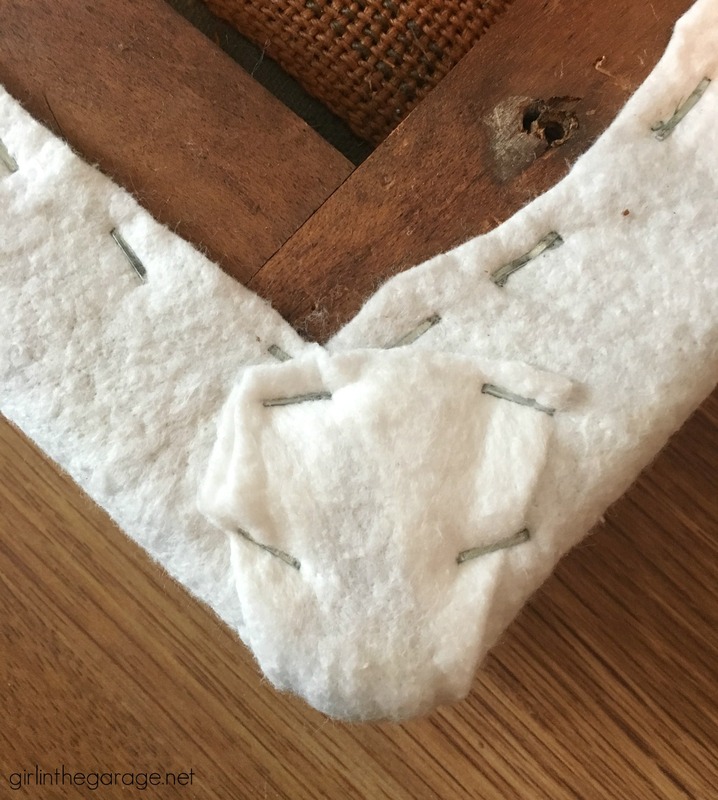 Next I used a heavy duty staple gun to attach the batting, and sometimes had to tap with a hammer to make the staples go in all the way. I used to use a basic upholstery stapler from Hobby Lobby but after using it so many times it really couldn’t keep up with my projects. 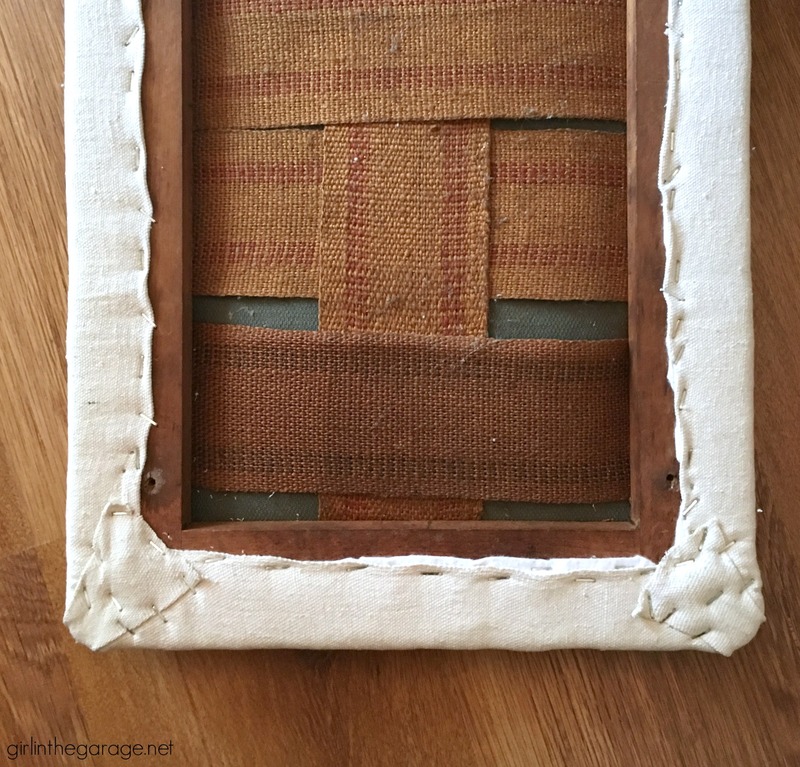 It’s fine though if you’re just starting out or only planning to do 1-2 simple upholstery projects. Be careful when folding the corners so you don’t have too much thickness – and don’t cover up the holes where the screws go! First start with painter’s drop cloth from the hardware store (or order here online). Wash and dry to make it softer and in case it might shrink. Cut the cloth several inches wider than the bench on each side and then iron it. Staple it over the batting, folding the unfinished edges under as you go for a neater look. Staple one side and then turn it around and do the opposite side, pulling tightly. Then do the last two sides. Finally, finish the four corners. It doesn’t need to look perfect but it shouldn’t look like a big mess either. 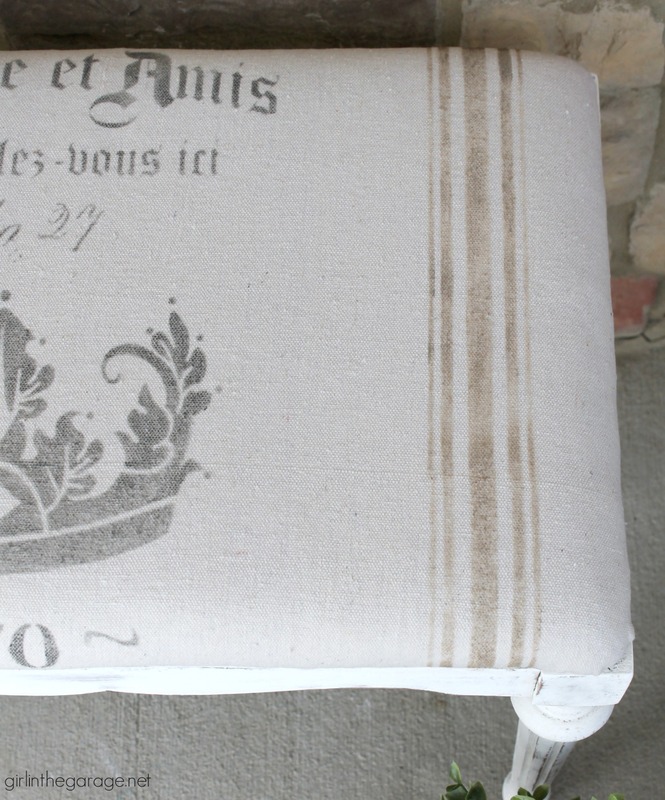 Next for your faux DIY French grain sack you will need a stencil like this one. Center it over the seat and tape it in place. 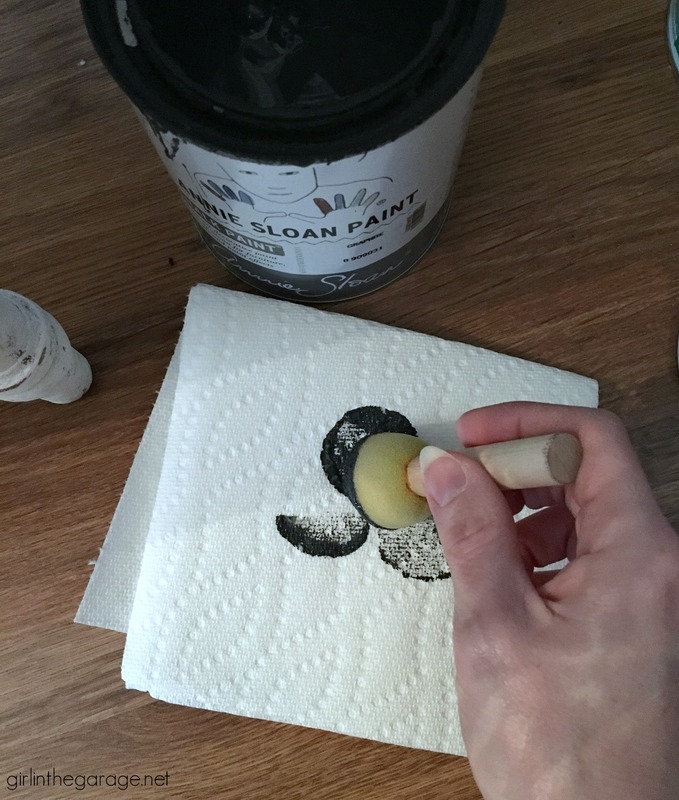 Then take a sponge pouncer and lightly dip it in black paint (I used Annie Sloan Chalk Paint in Graphite), then blot it onto a paper towel to remove most of the paint. 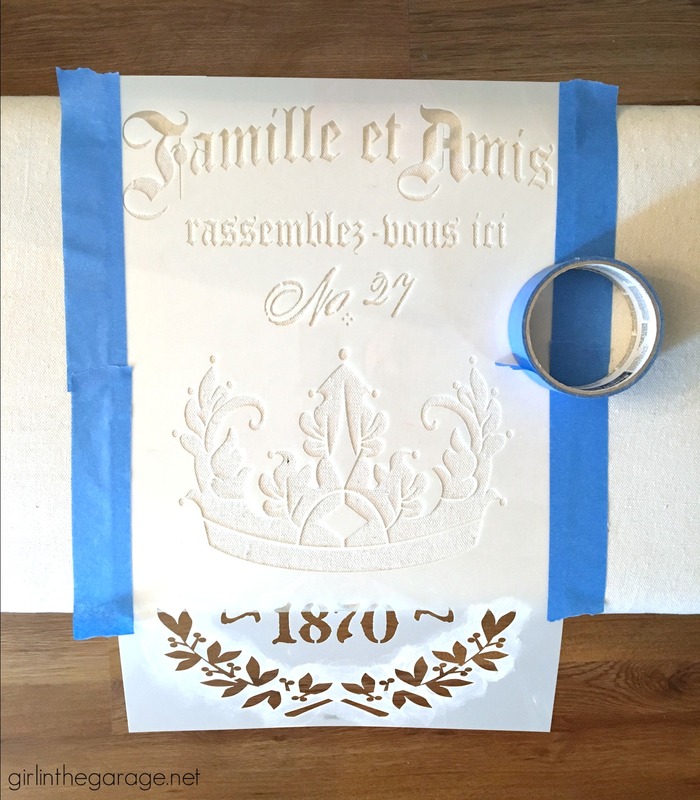 When you’re stenciling, less is best. 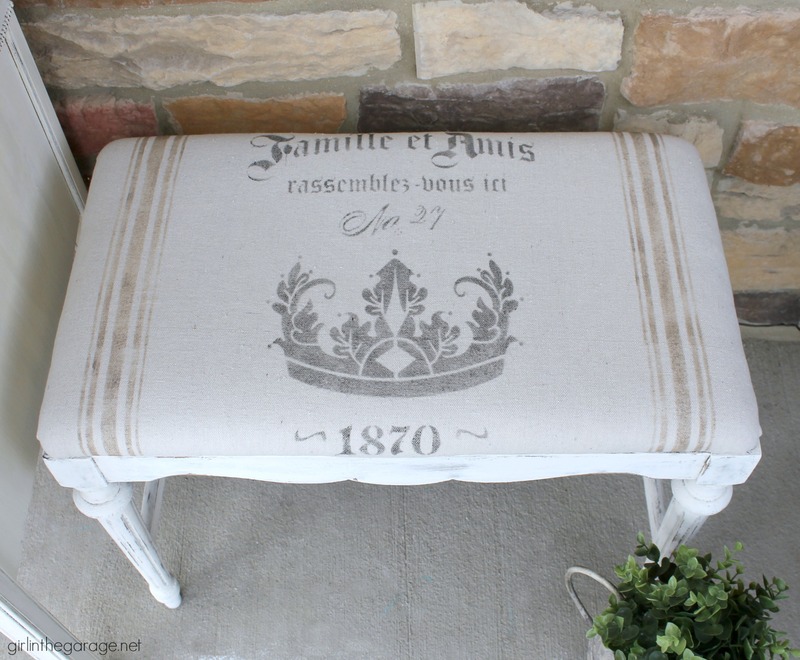 Use the pouncer to paint the French stencil onto the fabric. When you run out of color on the pouncer, dip it in the paint and blot again. 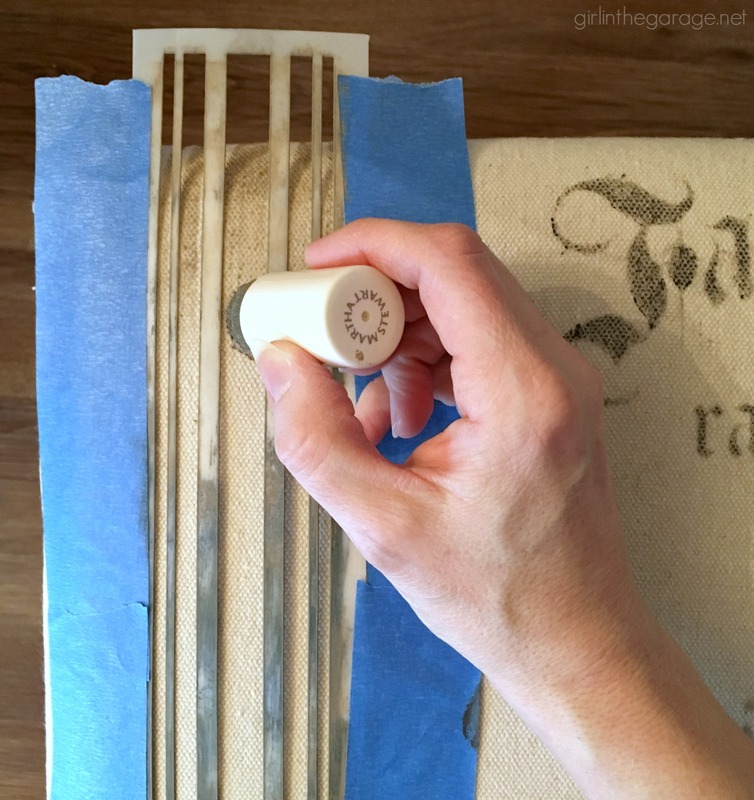 Once the middle section is finished, use a grain sack stencil (or just use painter’s tape) to add stripes on both sides. 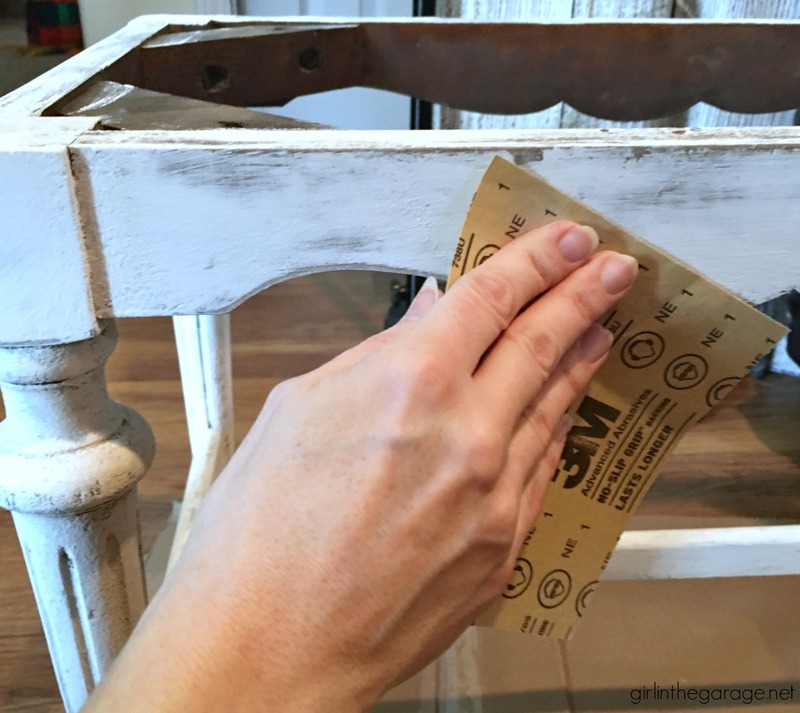 I used Annie Sloan Chalk Paint in Coco and a Martha Stewart pouncer this time, curving the stencil on the edges of the seat. 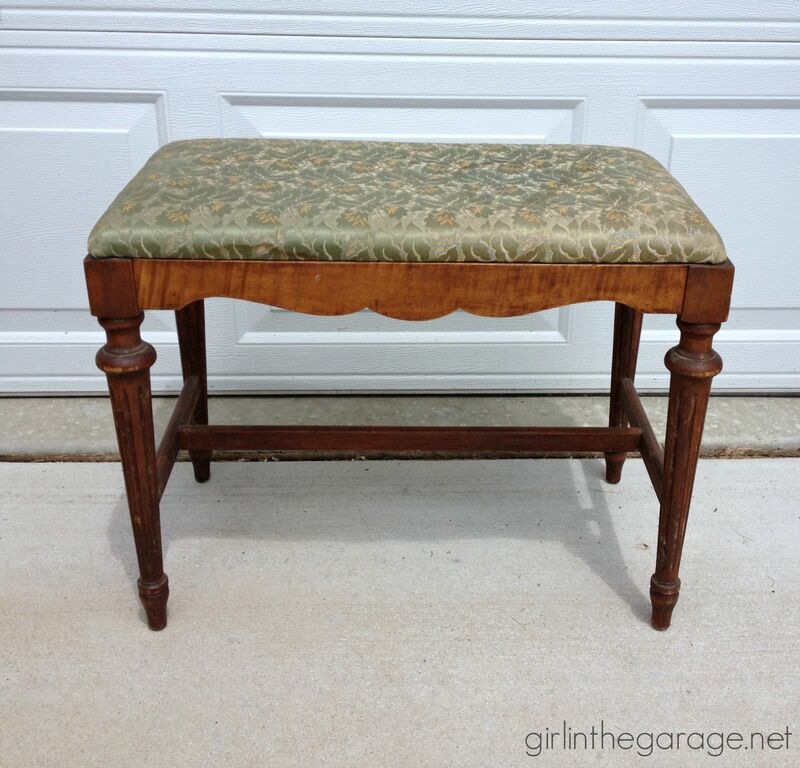 It’s time for this little bench makeover to head back to my booth! I have a feeling it won’t sit for several months this time. And here’s a handy before and after comparison again – feel free to Pin it for easy access later. 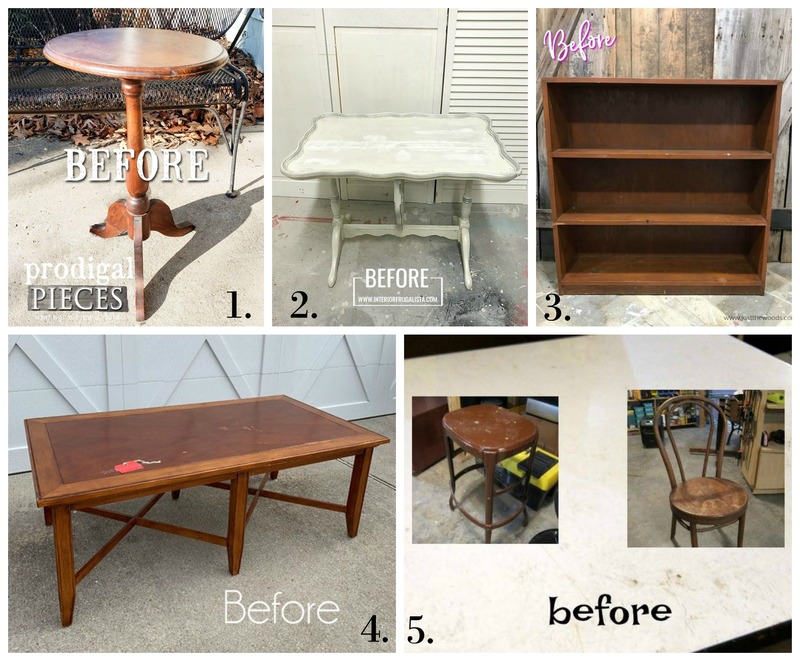 Friend, I would love to know what you think of this bench makeover-makeover. And I’d be so grateful if you’d Pin or share this online so others can learn and be inspired too. I’ll be sharing more tips soon for things you can try if a piece has been sitting too long without any bites. 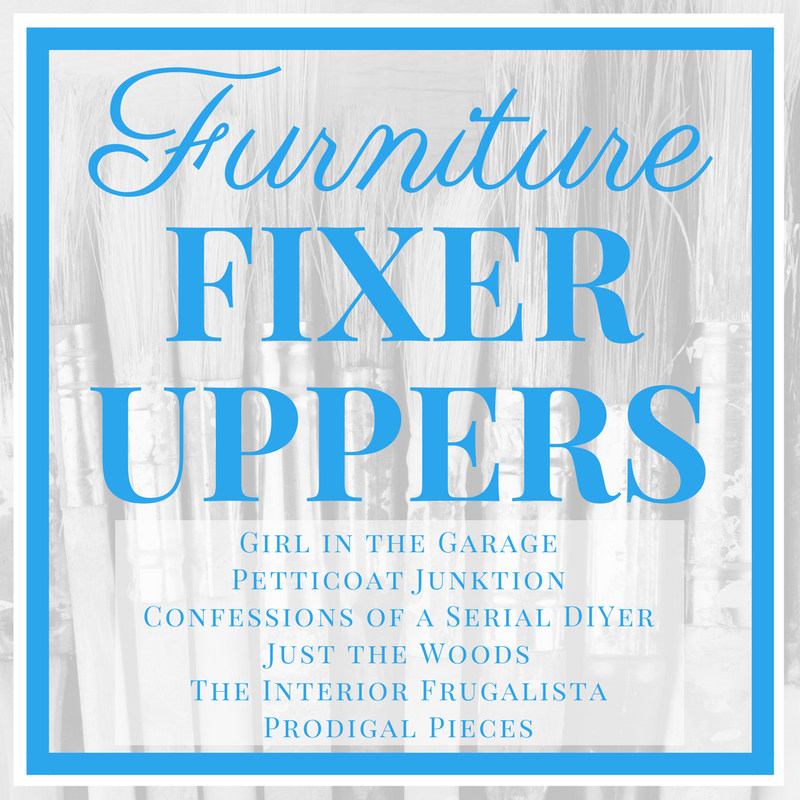 Now it’s time for Furniture Fixer Uppers day with my creative furniture makeover friends. Every month we get together and post our latest projects to inspire YOU. You gave it such a chic new look now, Jen. Beautiful. The bench is awesome and I bet it doesn’t last long! 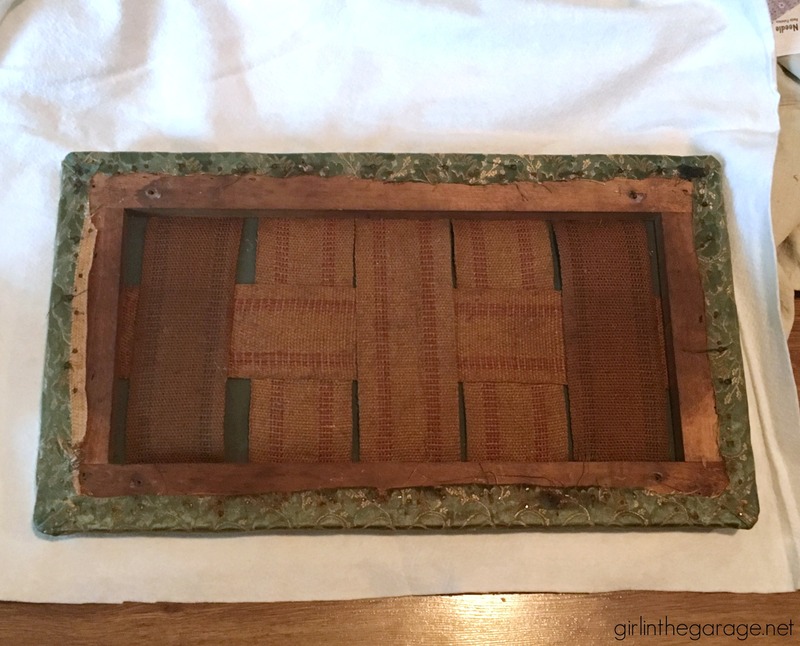 How clever using a stencil to give it that antique grain sack look. I am about to “Try to” reupholster 4 barrel chairs With drop cloths for kitchen table chairs. I love your linen towel effect, I think I can add that to the backs. Question: When you use drop cloths on a chair or bench, do you spray it with some kind of fabric protector? Although the fabric is inexpensive, the labor is still pretty time-consuming, so I don’t want to have to do this again if it is stained. Any suggestions? 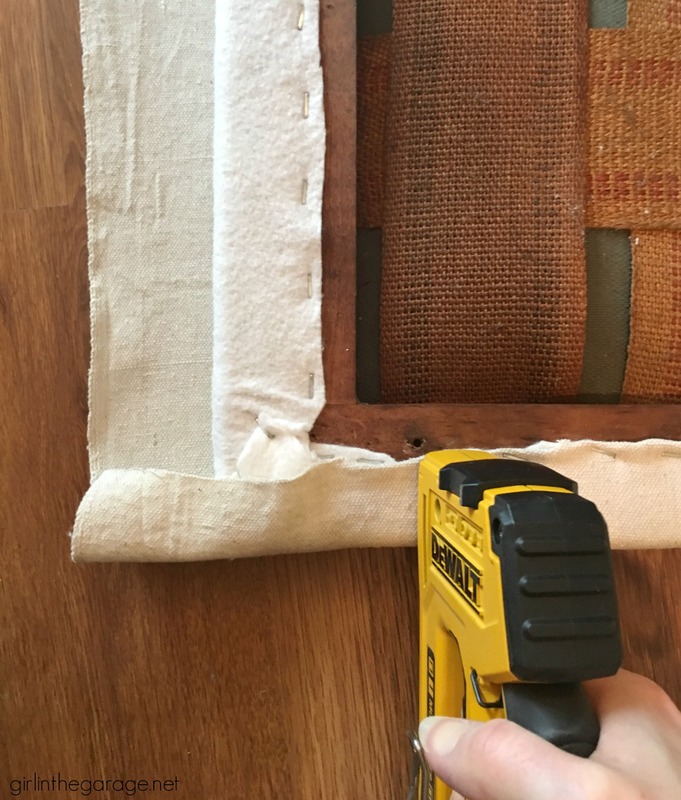 I spray everything i reupholster with scotchguard fabric protection spray. Girl, you should have no problem selling this bench now! I love all things French and if I lived near you I’d buy this in a heartbeat. 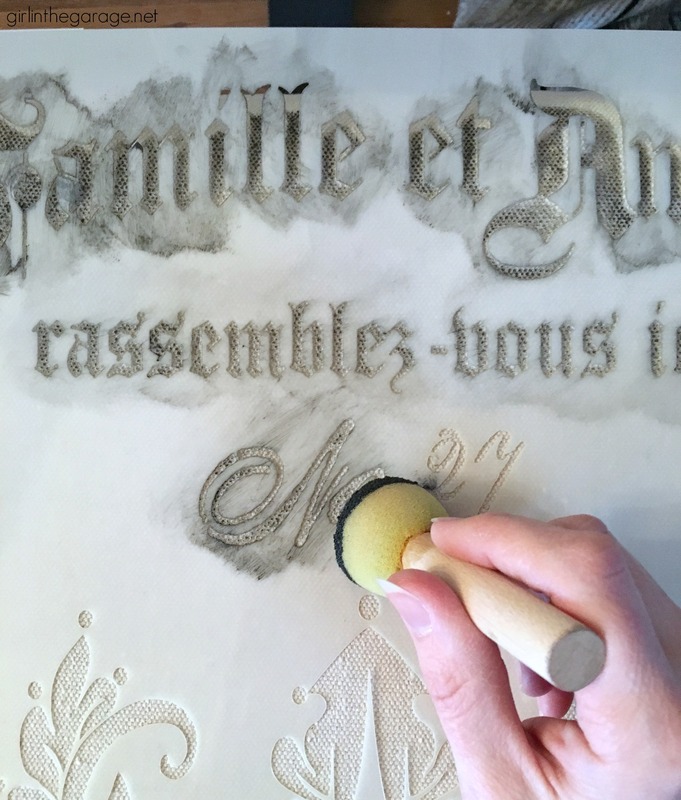 Really like how you stenciled it with both graphite and coco. 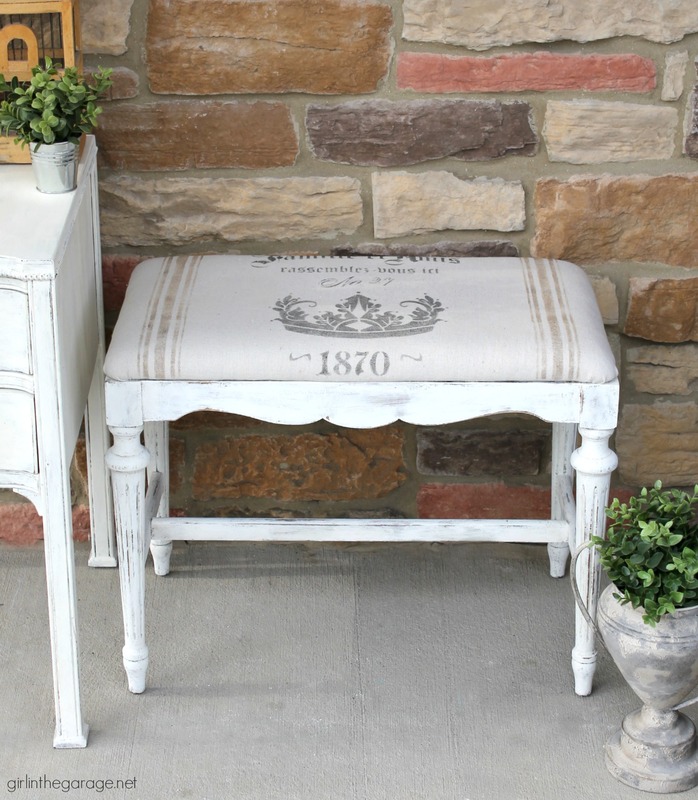 Love the grain sack bench makeover! It should sell in a hurry. Where did you get the grain sack stripe stencil? I love it. It looks too good to be true. I’m trying new things but it takes time and patience. Love the new look, but I love the pillow case also. It is beautiful and should sell immediately. This is just gorgeous. I love the stencil you used, it is perfect! I LOVED the white one and I like this one as much! Good job!! Third time the’s charm! At least for my tastes; but there was absolutely nothing wrong with the first two makeovers. Love your site; learn so much and want to tell you just how much I appreciate your taking all of your valuable time to share your knowledge, talent and skill. Gail, you are so sweet – you made my day with your comment. Thank you!! It’s so sweet, I can’t imagine it will sit around long this time, Jen! 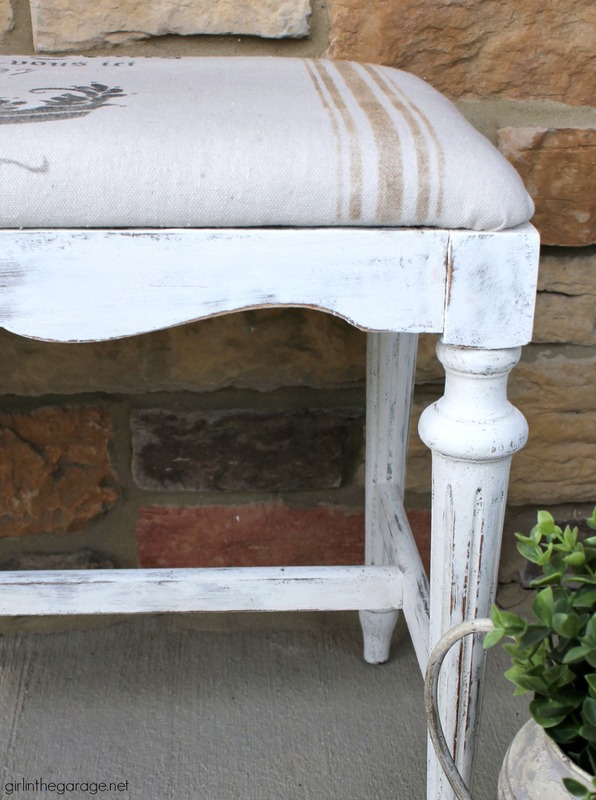 I always forget how versatile the humble drop cloth can be – thanks for the reminder. It’s so sweet, I can’t imagine it will sit around long this time! 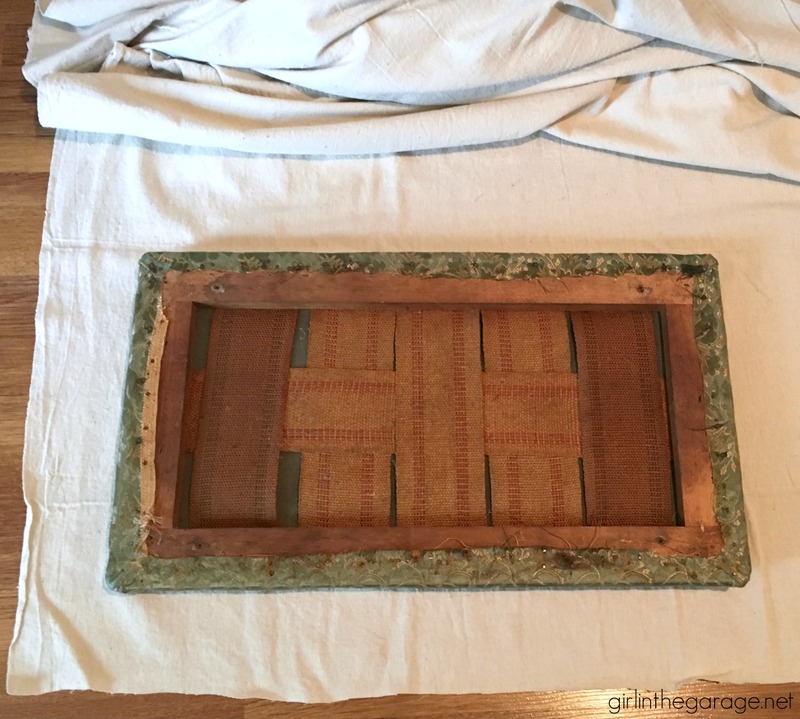 I always forget how versatile the humble drop cloth can be – thanks for the reminder, Jen. Thank you so much Marcie – I always appreciate your kind words! This is my favorite makeover. I love the colors and design on the fabric cover! Looks gorgeous! Did you seal the paint with anything? Thank you! I did not, but it could easily be protected with Annie Sloan’s clear wax or a spray fabric protector. I think that the reason it didn’t sell the first time with the embroidery is that it is sized to be a bench under the makeup counter in the bathroom. Sitting on embroidery every day would probably have damaged/pulled the threads after a while. Also accidentally dropping makeup on white fabric is not so good. Pretty but not durable. Now your design is much more practical. Robin, that is very true. Thanks for your insight and your comment!